Carolyn Finzer collects artifacts across all artistic borders and ethnic cultures and then incorporates them into her home or garden or, even better, into new works of art. She scoops up donated orphan blocks at guild meetings because recycling is what she does. She began checking dumpsters and other discard locations years ago as a Naperville art teacher, when the budget for student art programs was too small to support the expense of basic materials for the classes she taught. It became a life-long habit. 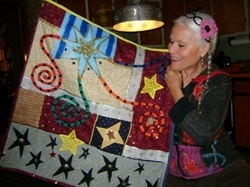 Although she is not a traditional quilter, her home is filled with acquired quilts of diverse origins. Many are small artistic works she created herself from recycled materials. She says she can’t ignore a challenge, so when members were challenged to make a star quilt, she used up odd bits of this and that, including an orphan block. 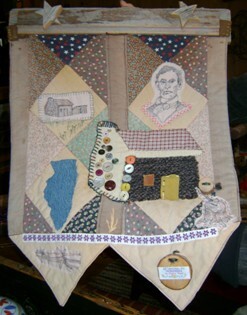 Another small quilt she created honors Abraham Lincoln. It was made of various re-used fabric and hardscape materials and displayed at New Salem State Park before it came back home. 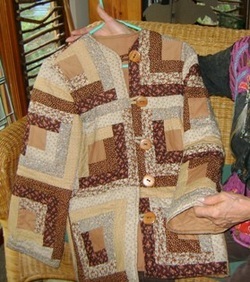 She also made herself a log-cabin-block jacket which has served her well for a long time. A member of a five-generation Naperville family, Carolyn is also a noted story-teller. Ask her about Gourdelia, her guru of gourdology! And if you’ve been to the Naperville Post Office, you’ve seen the results of her gardening work in the creation of a natural prairie landscape around the building. Her home landscape is also very appealing as it tells its story through recycled objets d’art, a secluded little “goddess grotto,” and too many native plants to name. Carolyn is eclectic and energetic and has a great many credits to her name. She contributes her talents to furthering the goals of the Girls Scouts, a group very close to her heart, and in fact this is her 48th year as a registered Girl Scout! She has been involved with fifteen public benefit art sculptures. Also she and her husband have been North Central College “Friendship Family” parents to eight international students and she belongs to Prayer Shawl knitting ministry.